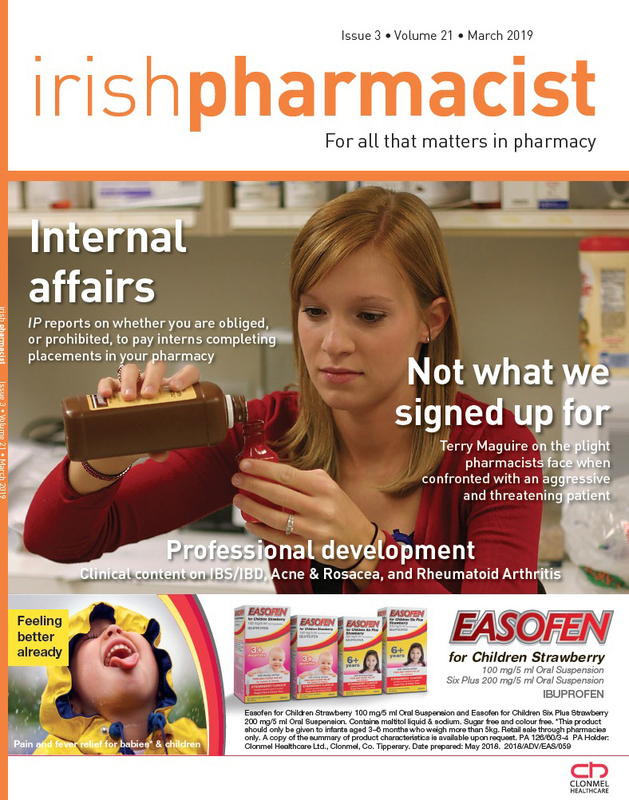 PharmacistCPD is a free online continuing professional development website restricted to Irish pharmacists and healthcare professionals. By registering and/or using this site you are indicating that you agree to these Terms and Conditions. From time to time we may change these terms and will post the revisions on our website. PharmacistCPD reserves the right to refuse membership to any individual without explanation. While every care has been taken in preparing material for publication on this website, PharmacistCPD and its owners, staff and contributors expressly disclaim all legal or other liability which may arise as a result of any inaccuracy, statement, error or omission of whatsoever nature contained in any PharmacistCPD content. The information on this site is strictly for educational purposes only. The information provided should not be relied upon in determining diagnosis, medical treatment, legal rights or other decisions. Readers should verify all information and data before treating patients or employing any therapies described in this educational activity. Occasionally the modules may discuss therapeutic products that have not been approved by the Irish Medicines Board as well as off-label uses of approved products. A qualified healthcare professional and/or relevant authority should be consulted before using a therapeutic product outside of the authorised indications. Users should be aware that professionals may have different opinions. Because of differing expert opinions and ongoing advances in medical research, combined with the possibility of human error, users should independently verify specified information in relation to diagnostic methods, evidence, treatments, follow up and prognosis. Information regarding drug therapies, particularly in relation to indications, dosage, contraindications and side effects, should be verified via the relevant authority and/or the manufacturers guidance. We strongly recommend that readers independently verify any information that they chose to rely upon.Please also note that information on this site is generally updated every two years and may be out of date at the time of reading. The information provided on this website should not supersede the user's own clinical judgement in relation to patient care. We do not guarantee that by the completion of any of our learning modules you will automatically fulfill your CPD requirements. We rely on the authors of articles, contractors and third party data providers to confirm the accuracy of information presented and to describe generally accepted practices. Therefore we, as the publishers, cannot guarantee its accuracy or that this meets all or any requirements for professional development. To the fullest extent permitted by law, PharmacistCPD expressly excludes any liability for any direct, indirect or consequential loss or damage incurred by any user in connection with the information contained on this website, or the content contained on any websites linked to this website - and any material posted on it, including but not restricted to any liability for loss of income or revenue, loss of business, loss of profits or contracts, loss of anticipated savings or earnings, loss of data, loss of goodwill, and any other loss or damage of any kind, however arising and whether caused by tort (including negligence), breach of contract or otherwise, even if foreseeable. PharmacistCPD aims to make this website available 24 hours a day, seven days a week, but reserves the right to suspend access to this site and any or all of PharmacistCPD services at any time, without notice, for maintenance purposes or if a breach of security, breach of Terms and Conditions, or any unlawful use of this site or PharmacistCPD services, is suspected. PharmacistCPD may, at its discretion, restrict the use of this site in such instances. You should ensure that your PharmacistCPD password is kept confidential and used only by you. We reserve the right to disable any user password - whether chosen by you or allocated by us - at any time if, in our opinion, you have failed to comply with any of the provisions of these Terms and Conditions. The content, layout, design, data, databases and graphics on this website are protected by Irish and international intellectual property laws and are owned by PharmacistCPD. All rights are reserved. None of this material may be reproduced or redistributed without our written permission. You may, however, download or print a single copy for your own non-commercial off-line viewing. Any request for permission of our content or images, or other use of our intellectual property, should be made in writing. For contact details see Contact Us. PharmacistCPD may contain links to other websites. Links are provided for your convenience, and an inclusion of any link does not imply endorsement or approval by us of the linked website, its operator or content. We have no control over the contents or functionality of linked sites and accept no responsibility for any loss or damages that may arise from your use of them. Before you use such websites we advise that you read their terms and conditions and privacy policies. If you have opted to receive marketing emails from PharmacistCPD, you may occasionally be sent emails by us, but your personal details will never be passed to a third party. You have the right to choose not to receive marketing emails when you first register. If you have any queries please see Contact Us.